Canadian poet Ondaatje (The Collected Works of Billy the Kid) made two return journeys to his birthplace, Ceylon, in 1978 and 1980--and the result is this slight, graceful mosaic: a collection of poetic impressions and less poetic (but far more involving) Ondaatje-family stories. "How I have used them. . . . They knit the story together, each memory a wild thread in the sarong." Thus, Ondaatje pieces together his parents' histories from elderly relatives still living in Ceylon--Aunt Dolly, for instance, whose "80-year-old brain leaps like a spark plug bringing this year that year to life." And the world of these memories is primarily that of 1920s/1930s Ceylon high-society--not the European colonials, but the resident elite: "Everyone was vaguely related and had Sinhalese, Tamil, Dutch, British and Burgher blood in them going back many generations"; the preoccupations were gambling, drink, romance. So most of the friends and family hardly noticed at first that Ondaatje's suave soldier-father was an alcoholic--until he began ripping off his clothes on the railway or (in desperation) draining the liquid from kerosene lamps into his mouth. And grandmother Lalla, too, was an ancestor worth reconstructing: an earthy, merry widow ("loved most by people who saw her arriving from the distance like a storm"), the first woman in Ceylon to have a mastectomy, the triumphant victim of a 1947 flood--"her last perfect journey," evoked in imaginative detail here. 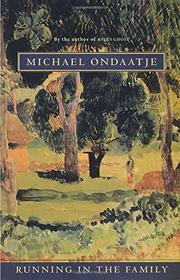 Ondaatje captures less personally particular aspects of Ceylon as well: the heat, the snakes, the beautiful alphabet, the exotic wildlife. But, while there's no strong dramatic shape to his rediscovery of his parents' past (Ondaatje himself remains a blur), it's the family history that almost always holds this delicate assemblage together-and extends its appeal to a readership beyond Ondaatje's poetry-oriented following.